Al Ihssan Sunday School is pleased to inform you that the registration for 2018-2019 school year is now open. Space is limited. The registration deadline is September 2, 2018. Late applications will be accepted between September 3rd and September 9th. There will be no late registration fee. Registration will be completely closed after September 9th. Sunday School begins on Sunday, August 25, 2018. You can download and fill the application form and submit it to our school at Apex Mosque – 733 Center Street, Apex, NC 27502. Contact us at (919) 362-0403 or via email: apexmosque733@gmail.com. PLEASE NOTE: there is a wait list for the kindergarten class (ages 5-6) as the class is currently full. At Al Ihssan Sunday School, our primary goal is to impart a strong Islamic identity to our youth and complement their regular education to build a strong community for the next generation. Our community is very diverse in terms of national origin, ethnicity, culture, and theology. Our curriculum aims to impart an authentic introduction to Islam, drawing on materials that are contemporary as well as historical. The academic objective of Al Ihssan Sunday School is to introduce and instill the main teachings of Islam into our students by the time they are ready to enter high school and enabling students to live Islam. The tuition covers the entire school year (about 9 months) and includes course materials (e.g., bag, textbooks, notebooks) and snack. Fees may be paid by check or cash only. For Kindergarten Students: Level K book is a textbook and workbook—under one cover. This book is a perfect tool to help children get the necessary foundation of Islam. The foundation begins with knowing about Allah—the Creator. The best way to know about the Creator is to look at His creations. After forming a children’s concept of Allah, the book takes them to learn about Islam and Muslim. After finishing a few months of activities, the book takes the children to an early understanding of the 5-Pillars of Islam to help them progress through other areas of the curriculum in the coming years. Islamic festivals and stories of Nabi and Rasul are presented through concept-building exercises and interactive activities. For First Level Students: Level 1 Islamic Studies book uses easy to understand simple and child-friendly languages and sentences. The book has 28 lessons on Allah, the Qur’an, Islam, Rasulullah (S), the Hadith and Sunnah and 5-pillars of Islam and so forth. The idea is to cover the basics of Islam. Each lesson begins with a coloring page. The coloring time helps students settle down and be comfortable in the class before the lesson begins. The attention span of children is short; therefore, short paragraphs introduce two or three concepts. This is followed by in-class review section to allow for a short break and reinforce learning. Some homework is included in the book. A separate workbook comes with this textbook that has many more test questions and chapter-based activities. For Second Level Students: Level 2 textbook has 28 lessons. It begins with a few topics on Allah, the Qur’an, Islam, Rasulullah (S), the Hadith and Sunnah. The concept of 5-pillars of Islam is reintroduced with additional details. Students will learn about four Rightly Guided Khalifas, a short history of 6 prophets, Islamic values and morals, Day of Judgment, Muslims from different nations and so forth. Each lesson begins with a coloring page. The coloring time helps students settle down and be comfortable before the lesson begins. The attention span of children is small; therefore, short paragraphs introduce two or three concepts. A separate workbook comes with this textbook that has many more test questions and chapter-based activities. For Third Level Students: Level 5 textbook. With the progress through Islamic Studies curriculum, students are now introduced to several new topics with greater depth. Level 5 book introduces the key events in Madinah, for example, the battles in Madinah–leading to the Hudaibiyah Treaty and Liberation of Makkah. The key events from the life of Adam (A), Luqman (A), Ayyub (A), Zakariyyah (A), and Yahya (A) are covered. The events from the life of Ibrahim (A) and Yusuf (A) are covered in multiple lessons. Homework continues to be intensive. Students are required to consult a translation of the Qur’an to answer some of the homework assignments. Homework is included in the textbook, however, a separate workbook comes with this textbook that has many more test questions and chapter-based activities. For Fourth Level Students: Level 8 textbook. Students are now introduced to additional new topics with greater depth. Students will now learn the objective of the Qur’an with a new perspective. Interesting topics such as Trials in Life, Importance of Hope, Friends and Friendship, Duties Toward Parents and so forth are covered. These topics will build excellent moral grounds in the students. The book reintroduces some of the key events from Rasulullah’s (S) life in Makkah with an objective to highlight the abiding teachings we can learn from them. Students will learn the history of the major battles and also the activities of some of the non-Muslim tribes living in Madinah. Several other topics cover Islamic values and morals. Homework becomes more intensive. Students are required to consult a translation of the Qur’ān to answer some of the homework. Some homework is included in the book, however, a separate workbook comes with this textbook that has many more test questions and chapter-based activities. For Fifth Level Students: Level 10 textbook. This book contains thought-provoking topics such as Analysis of Surah Al-Fatiha, the Bible and the Qur’an, Ten Commandments in Islam, Women in the Qur’an, Status of Women in Islam, Marrying Four Women, Difficult Questions on Marriage, A Muslim Family, Superstition, Racism and Islam and so forth are covered. Many of these topics provide materials for inter-faith discussion. All topics are sure to provide high-school students sufficient materials for serious, intelligent discussion. As the students are more mature, homework becomes more intensive. Students are required to consult a translation of the Qur’ān to answer some of the homework. Homework is included in the book, thus eliminating the necessity to buy another homework book. 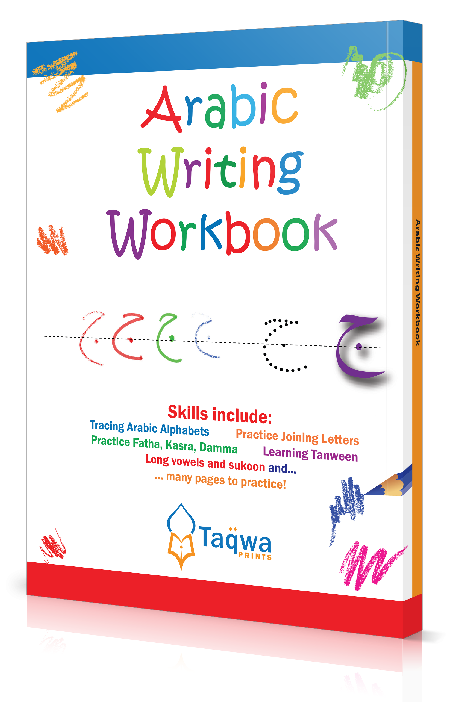 Arabic Writing Workbook: This workbook is designed to teach students the essentials of Arabic handwriting. It teaches students everything needed to write Qur’anic Arabic in a satisfying, rewarding manner. 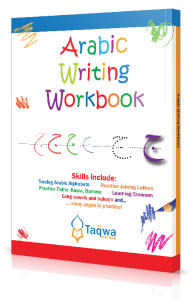 Starting from basic alphabets, the workbook introduces the beginning, middle and end shapes of each letter and how they join in a two-, three- or four-letter words commonly used in the Arabic language. 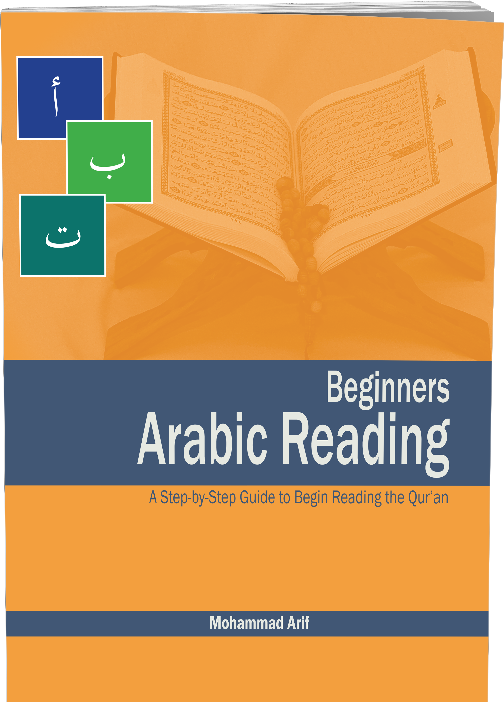 The Beginners Arabic Reading: This book is a step-by-step guide to begin reading the Qur’an. It introduces the Arabic alphabets, gradually demonstrating their beginning, middle and end shapes and how these are used in Arabic words. 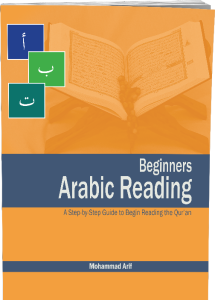 The book covers all the essential vowel marks and shows the students how they are used in a simple to complex Arabic words commonly found in the Qur’an. After finishing the book, a student is expected to be ready to begin reciting the Qur’an. Juz Amma for School Students: In Juz Amma, each Surah begins with a short introduction. The surah is followed by an explanation of the verses based on the authentic commentary. A “words to know” section provides root and derivatives of several keywords used in the surah. This is further elaborated into a word-to-word meaning of the entire surah. This is followed by an “Application of the Message” section where the overall theme of the surah is highlighted in a manner that children can now apply the message of the surah in their everyday lives. The chapter ends with several review questions to help students refocus on the teachings of the surah and reinforce the materials learned. 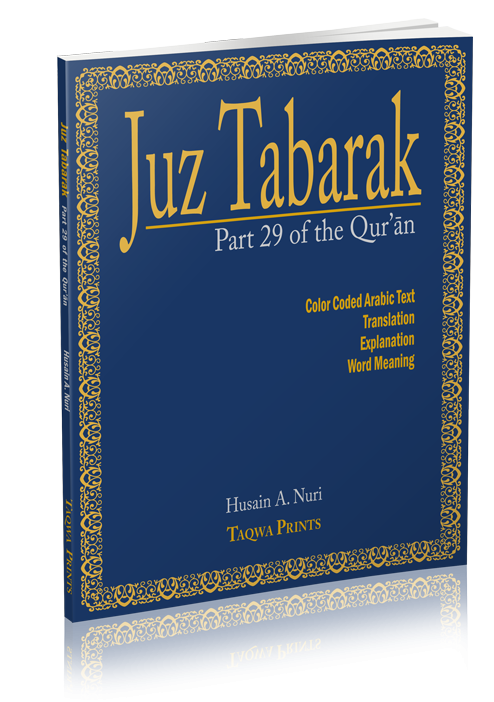 Juz Tabarak: Each surah or its part begins with a short introduction. The surah or the part is followed by an explanation of the verses based on the authentic commentary (Tafseer). A “words to know” section provides root and derivatives of several keywords used in the surah. This is further elaborated into a word-to-word meaning of the entire surah. This is followed by an “Application of the Message” section where the overall theme of the surah is highlighted in a manner that children can now apply the message of the surah in their everyday lives. The chapter ends with several review questions to reinforce the materials learned. Recitation of Qur’an: The objective of the Sunday school is to facilitate students in the reading of the Qur’an – not learning Arabic language-; however, basic introduction to Qur’anic Arabic terms/phrases will be taught. The recitation of Qur’an requires very active follow-up by parents at home. The Al Ihssane Sunday School is not intended to be a program that trains children in the reading or memorization of the entire Qur’an in Arabic. We have other programs at Apex Mosque that fulfill this need. Memorization of Surahs and Duas: Memorize 25-30 Surahs and Duas related to Salat and everyday affairs. Salat: Al Ihssan Sunday School’s goal is to make sure children know how to perform Salat. Children in 6th grade and higher are expected to know how to perform Salat. Qur’anic Studies: Basic Qur’anic teachings; study about the tafseer/exegesis at higher levels. Islamic Morals and Manners in the light of the Qur’an and the Hadith. Faith and Worship: Articles of Faith, Five Pillars and Worship of Allah (SWT). Introductory Fiqh: Basic Fiqh, Shariah and Usul-Fiqh. Seerah: Life history and Shama’il of Prophet Muhammad (PBUH) – taught at various levels. Introductory Islamic History: Brief overview of Islamic history. Introduction to Prophets: Stories of Prophets for younger children. Islam’s contributions to civilization: taught at the High school level. “Living Islam”: Practical applications of topics taught through Suffa’s WILP. Personal development practicum for the youth group to enable them to build key skills essential for success. Lunch: 12:10-12:30 pm (20 minutes) – Students are encouraged to have their wudu after lunch so that they are ready for Zuhr Prayer. Boys; Cover all body from neck to below knee. Girls; Cover all body from neck to ankles and wrists in loose clothing. Wear a hijab. 4 Tardy will result in being marked as one absence; parents will have to come talk to the school about the tardiness. 2 consecutive absences will result in a parent-school administration meeting. Indecent language and violent behavior would result in immediate suspension from school until a parent/school administration meeting to resolve the reason for the offending behavior. Students are not allow to leave the school campus at any time without expressed/written permission from the school administration. Students moving out of the school campus will be suspended in school pending arrival of parents and resolution in the presence of the parents and school administration regarding the reason for leaving school property without permission. School may readmit students upon successful resolution of the cause of the problem. All textbooks are provided. In case your child loses his/her textbook, a replacement book will cost $15.00 for each book.